Just the name magnolia evokes images of graceful, southern charm. Magnolia shrubs range from deciduous to evergreen and provide a variety of flower forms and sizes in white, pinks and purples. Species can range from 15 foot tall, bushy specimens to 80 foot tall trees. 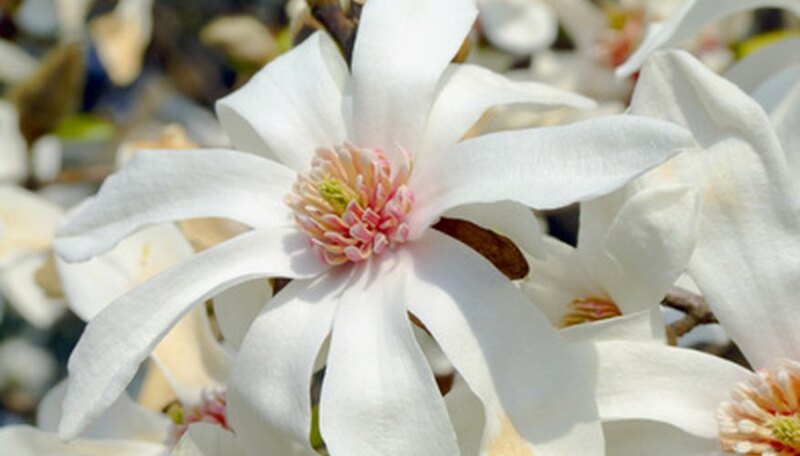 Care for the magnolia is relatively simple especially in warm weather climates. Choose a site with good drainage in full to part sun. Prior to planting shrubs and bushes, amend the soil with a leaf compost. Add several inches to the surface and cultivate into the soil to a depth of 8 to 10 inches. A balanced, slow release fertilizer may be added across the entire planting bed at the rate suggested by the manufacturer and cultivated into the soil at this time. Dig a hole three times as wide as the root ball of the shrub and just deep enough for top of the ball to sit at surface level. Prepare the root ball by gently loosening roots and cut any that are circling the ball to ensure proper growth. Set the root ball into the hole and backfill with soil, firming with your hands as you go. Add up to 3 inches of organic mulch, such as pine bark, over the planting bed. Do not allow the mulch to come into contact with the trunk of the shrub, which may encourage disease. Water magnolias well after planting. Most magnolia species are drought tolerant, but the Southern Magnolia, or M. grandiflora, will grow more prolifically with additional water. Keep up on removing leaf litter that will accumulate around the base of the magnolia shrub over the growing season. The often 10 inch long leaves of the magnolia are leathery and will not decompose quickly, causing an unsightly mess encircling your shrub. Leaf litter can also harbor and spread disease amongst healthy garden plants that they come into contact with. Discard possibly infected leaves; do not compost. Add additional fertilizer only if a yearly soil test suggests that a necessary soil nutrient is absent. Soil tests may be conducted using a home test kit, available at garden centers, or by sending a sample to a local university extension office. Applying unnecessary fertilizer to shrubs can cause poor growth, reduced blooms and other problems. Prune the magnolia just after flowering since blooms appear on old wood, or last season's growth. Pruning later in the season or early spring will remove buds that produce blossoms, resulting in a disappointing flowering season. Prune lightly for improved shape, by cutting back suckers that grow from ground level away from the main trunk. Cut back branch tips to encourage more blooms. Also remove diseased or dead canes. Protect magnolia shrubs in winter from harsh winds. In areas where ice storms or heavy snow storms are expected, magnolias are susceptible to branch breakage and other damage. The best way to combat severe weather damage is to choose cultivars that are suitable for your climate zone and general weather patterns.